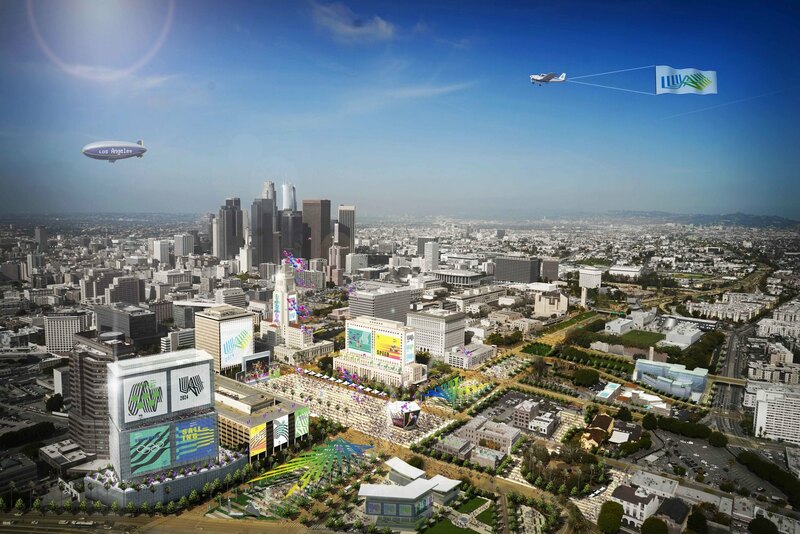 The Los Angeles City Council decided to join forces with Non Profit friends of Park 101 to try and find federal, state, and local funding for this project that would link the two sections of Downtown Los Angeles long and the highway with pedestrian thoroughfares. What that means is a possibility of creating a laced area between the Civic Center and Chinatown, Olvera Street and Union Station, topped with a vast green space. The visualizing goal of Park 101 is space for parkland, outdoor music events, soccer fields and kite-flying. The intention is to bring the original feel of people populating the streets of LA back. Further up the 101, in Hollywood, would be plans to cap the freeway and build a 38-acre park with an amphitheater, dog park, and bed & breakfast. Park 101 is a visionary urban design solution to cap the 101 FWY in Downtown Los Angeles— reconnecting the city’s historic core, north of the freeway, with the civic, cultural, and financial cores of modern Los Angeles to the south. It has hopes to celebrate the generation of urban parks and give back to the City of Los Angeles in important and subtile ways. Park 101 is seen as both the catalyst for urban renewal and logical outcome and intention of transit investments. It hopes to be a roadmap towards urban sustainability and economic prosperity. The project team has subdivided the greater PARK 101 District into three sub-districts: the Park, the Station, and the River. The feasibility study has focused on illustrative phasing for the Park sub-district in order to provide details on specific design opportunities, costs, and economic benefits resulting from development and implementation.